Easy Cranberry Basil Shrimp Cocktail with the best homemade cocktail sauce. Paleo and low carb! 1/2 to 2/3 c Gluten free cocktail sauce (We love this brand) or you can make your own, see notes. Pinch of black pepper and/or peppercorns for garnishing. Note: want is spicy? add in 1 tbsp fresh tabasco or chili sauce. First, boil your shrimp. Cook the shrimp, stirring occasionally, until they turn pink, about 2 to 2 1/2 minutes for medium shrimp, 3 minutes for large ones. Drain the water and then cool the shrimp to room temperature. Devien and place in ice. Next make your sauce. In blender, combine your, cranberries, basil, and cocktail sauce. Blend then add in 1- 2 tsp of lemon juice, sea salt, and optional honey. Blend until smooth. If it’s not creamy enough for your liking, blend on low and slow add in 1 tbsp extra virgin olive oil or grapeseed oil..For extra spicy, mix in 1-2 tsp tabasco sauce. Spoon sauce into bowl and garnish pepper, extra cranberries, and herbs. 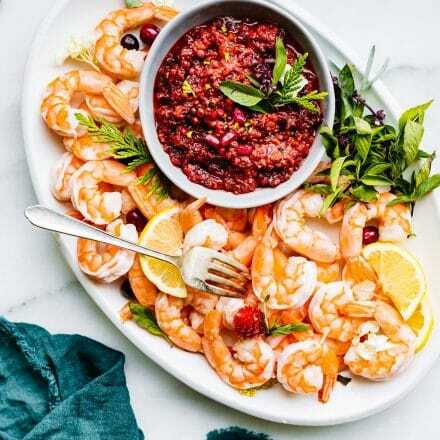 Place shrimp and veggies around the bowl and garnish platter with extra basil. Squeeze fresh lemon on top of shrimp before serving. Make sure to keep your shrimp on ice to keep cold. Shrimp are safe at room temperature for 2 hours but need ice to maintain freshness if left out longer. See notes for other uses of sauce! If you don’t want to cook the shrimp for shrimp cocktail, simply buy frozen precooked shrimp and thaw in bowl in refrigerator overnight. Squeeze fresh lemon on top before serving. For QUICK HOMEMADE COCKTAIL SAUCE simply mix together 1/2 cup of corn syrup free ketchup, 2 tablespoons fresh grated horseradish, gluten free Worcestershire sauce, 1 tbsp lemon juice, pinch of sea salt and black pepper each. I also like serving this cocktail sauce with cheese platters and gluten free crackers or veggie platter.